In California, employers by law must provide non-exempt employees with duty free uninterrupted meal breaks. A Los Angeles missed lunch break attorney can help you if your employer does not provide you with lawful meal breaks. We offer a free confidential initial telephone intake to prospective clients. We also accept cases on a contingency fee basis. If you believe your employer is violating meal break laws, call us now at (818) 237-5267 (Burbank) or (213) 986-8432 (Los Angeles) or (310) 295-1654 (Beverly Hills) or you can fill out our quick and easy online Case Evaluation Form; this is the fastest way to get your case screened by an attorney. In California, the law is that employees who work at least five hours in a day are entitled to a 30-minute uninterrupted meal period relieved of all duty and employer control. If an employee works 10 hours in a day or more, the employer must provide two meal breaks of at least 30 minutes each. Employers do not have to pay employees for their meal breaks, but the meal breaks must completely relieve the employee of all job duties. What Happens If My Employer Does Not Provide Me A Lunch Break? If your employer is not providing you a thirty-minute uninterrupted lunch break or not providing you a lunch break on time (i.e. within the five hour window), your employer is violating the law. Generally, for a missed lunch break, the employer must pay one-hour of pay at a regular rate of pay for each work day when the meal break is not provided; this is often referred to as meal period premium pay. If the additional hour is not paid, the employer may be liable for penalties, costs, and attorney fees associated with not paying the additional hour. Interrupted Lunch Break. An employee is told to take a lunch break for thirty-minutes, but is interrupted by her supervisor with work questions/tasks during the thirty-minute lunch break. This is likely a violation because the thirty-minute lunch was interrupted and therefore, the 30-minute lunch period was not relieved of all duties for the entire 30-minutes. Short Lunch Period. Only ten minutes have passed since the employee started to take her lunch break when the boss calls and tells her to call a client right away. This is likely a violation because the lunch break was less than 30-minutes, and therefore, the 30-minute lunch period was not provided pursuant to California law. Late Meal Break. An employee is forced to take a lunch break during his sixth hour of work because nobody can cover his position for him. This is likely a violation because the lunch must be taken within the five-hour window. Lunch Meetings/Lunch at Desk. An employee is told to take a lunch break at his desk. This is likely a violation because the employee is not free to leave and subject to the control of the employer. Similarly, a lunch work meeting also does not constitute a duty-free lunch. On-Call during Lunch Break. Repair technician is told that he must have his cell phone all throughout the day because customer calls might come in and that he must respond to as soon as the customer calls comes in. This might be illegal because the employee is being required to be on-call all day including the lunch period, and therefore he is being subject to the control of the employer. If customer calls come in while the employee is at lunch and he is expected to answer those calls, this would also not constitute a duty free lunch because work is being performed during the lunch period. Not Enough Lunch Breaks. Employee works for 12 hours but is only provided one 30-minute lunch break during the first five hours of work. This is likely a violation of California meal break laws because a lunch period is not being provided every five hours. In this scenario, the employee should have been provided with at least two 30-minute lunch breaks. Off-the-Clock Overtime. Waiter is given a thirty-minute lunch break but is told to clock out for an hour and work for the other thirty minutes. This is an off-the-clock violation as the employee is working but is not being paid for that time. Rosa Vigil-Gallenberg the founder and attorney of Gallenberg PC has recovered millions of dollars for employees who have not been provided meal breaks pursuant to California law. A Los Angeles employment lawyer at our office may be able to take your case on a contingency fee basis! To be considered, you can call our new client intake line or you can fill out our quick and easy online Case Evaluation Form; this is the fastest way to get your case screened by an attorney. We do not charge prospective clients for a confidential telephone intake or online case review. 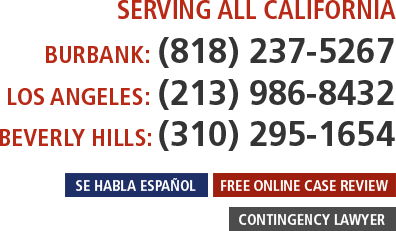 Submit your case for consideration now to a Los Angeles missed meal break attorney; please dial (213) 986-8432 now. For Beverly Hills, please call (310) 295-1654. To submit your case for review to an employment lawyer in Burbank and surrounding San Fernando Valley, please call (818) 237-5267.